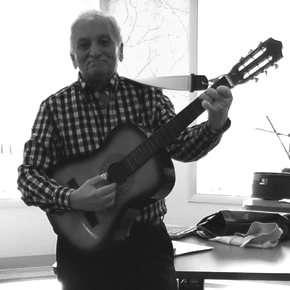 Joe Lombardi, a popular local performer for over 40 years, has been playing guitar since the late 1950’s performing classics and vintage favorites ranging from Johnny Cash and Elvis to Perry Como, inviting audience participation and honoring requests, whenever possible. His warm personal style is also known to appeal to children. "My father enjoyed playing the saxophone and guitar, so with the popularity of the guitar in 1956, I too became interested. My first performance in 1957 was for my high school assembly program. I have continued to entertain, singing and playing the guitar locally for birthdays, anniversaries, community and senior events. I entertain with Old Country, 50’s, vintage classics & favorites ranging from Johnny Cash & Elvis Presley to Perry Como."